Whether you’re celebrating your first blessed son or the arrival of your tenth grandson, the feeling of jubilation is indescribable. And, so, selecting incredible baby boy gifts remains a meaningful and thoughtful process. From a cozy little bathrobe to a monogrammed baby gown, the memories are priceless and forever treasured. When celebrating a new bundle of wee buddy joy, select one of these red or blue baby boy gifts. It’s a charming birth announcement pillow in the form of a book, with a personalized “cover” that includes baby’s and parent’s names and an interior that reveals a “dedication” with birth details. A truly cherished keepsake. If your little one is named Matthew, he will cozy up to a monkey, while Liam will join a precocious roller-skating lion. This storybook-inspired artwork pairs baby’s name with a playful animal that shares a first initial. The opposite side records details like birthdate, weight, and time, making it a lifelong keepsake for parents. Handmade of Baltic birch plywood, this wooden name puzzle is custom-made, sweet, and versatile. 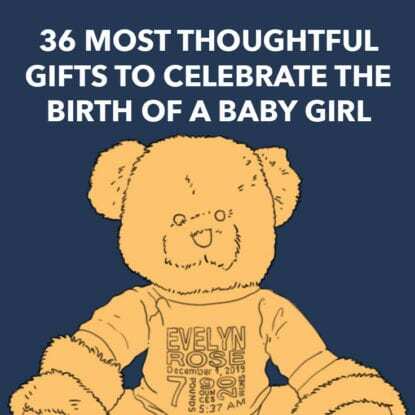 It can be given as a birthday, baby shower, baptism, or christening gift, or as an educational toy. The puzzle is affordable, the paints are safe and water-based, and there are also possibilities for engraving on the back. The beauty of this pillow is the personalization. Whether a newborn or a young child, you cast your darling wee dumpling as an adventurous literary figure, with features that include illustrations and custom rave reviews. It’s a soft, huggable tribute to your child’s precious individuality and forever a treasure for them and for you. Beautifully sculpted, crafted, and plated with an antique pewter finish, this vintage engine car is designed to hold lots of coins and savings for your little one. The Choo-Choo Train measures nearly six inches in length and features two areas for custom expression, making this fine cargo an endeared and cherished keepsake. Honor the arrival of your new baby boy with a monogrammed mini baseball bat. Fully functional and made of solid maple, the bat is custom engraved via laser with details that include birthdate and more. This gift is perfect for relatives of all sorts and deserves a special spot in the nursery. While your family may have settled in a Manhattan high rise or along the Colorado Trail, what makes a place special are the people who live there. Celebrate your family’s home with a tailor-made family and state print, with unique features, landmarks, and your family’s name; a one-of-a-kind keepsake. Illustrated in the iconic style of a coat of arms, this emblematic print pays homage to a child’s birth in a timelessly playful manner. Adorable toys and animals surround a shield that presents details about the new arrival, including weight, zodiac sign, parents’ names, and where the infant was born: a true keepsake. When searching for a memorable gift for a newborn baby boy, look no further than this site. These adorable fabric hearts are customized with the infant’s name, birthdate, and weight, accompanied by a sweet noteworthy quote. With 25 color options, the choices are many for your gentle bundle of joy. A perfect gift for a new mother, this darling gift set includes three burp cloths, bib, and baby blanket, all monogrammed with the bundle of joy’s moniker. The burp cloths are 100% cotton, six-ply cloths – thick and unlike the gauze types found in retail stores – and the blanket is 100% ring spun cotton. When searching for baby boy gifts, consider a handmade personalized baby picture frame. Choose from over 100 scripts, poems, and phrases and have them memorialized onto an 8-inch by 20-inch wood plaque that saves a 4-inch by 6-inch space for a special photo. A truly wonderful and joyful memory. This special story is about that extraordinary little boy in your life. It begins with an enchanting cover, personalized with your child’s name and initial. Once inside, your tot is greeted with your personal message, and then onwards to positive personality traits that he is still learning, so you can enjoy the inspiring journey together. Your little boy will be quite the gentleman with this soft quilted baby bathrobe. The robe is outlined in blue trim and features a hood and belt tie and bears your lad’s monogram or his full name. Or, stand out from the baby shower crowd and offer this as a gift. What better way to have your wee boy learn his name than by creating a book with him as the lead character? This made-to-order book features your child’s name on the cover, throughout the story, and in the illustrations, and the book is replete with dogs, owls, and crickets who wish your toddler pleasant dreams. A witty literary way to announce the birth of your tot is this delightfully original print which features a custom, storybook-inspired illustration and your “review.” There are several storybook titles available and the print comes framed or unframed. Either way, this captures the magic of the precious first years. The birth of a baby is a momentous occasion that begs for memorialization. This keepsake memory box feature’s your baby’s name, birthdate, weight, length, birth time, and location. There are three color options and the box is wrapped in silky matte paper. A true memento that will safeguard unforgettable memories. Encourage a love of the great outdoors from early stages with these charming burp cloths. Made of super soft fleece, velour, and flannel, the cloths feature moose, trees, and snowflakes on the front with fleece buffalo plaid on the reverse, while another features deer, mountains, and trees. Easy care, machine-washable, and generously sized. Memorialize your wee one’s going home with this award-winning monogrammed gown, fashioned from 100% seersucker. Available in four colors – green, light blue, white, and charcoal grey – this adorable, preppy keepsake is one-of-a-kind and ideal for photos and just plain opportunities for cuteness. Machine-washable, super soft, and a beautiful remembrance of your baby’s birth. Pay tribute to a newborn making a debut with this custom-made pillow with features that include specially made, storybook-inspired illustrations on each side, along with a custom rave “review.” The cover is machine-washable and it’s a soft, safe, and huggable accolade to your child’s cherished individuality and a forever keepsake. Mark the arrival of your beloved baby with a birth year box. Lined with wool felt and made of basswood, maple veneer, and birch plywood, this captivating box comes complete with a tiny envelope that will hold a lock of hair as well as space for baby’s first pair of booties and heartwarming memorabilia. When you’re seeking ideal baby boy gifts and you think you’ve exhausted every option, how about a handmade nursery name sign with majestic mountains as a backdrop? This version is ecologically safe, lightweight, and features a satin finish on a high quality faux wood pattern which will suit nurseries, bedrooms, or playrooms. Share your new arrival’s ETA with this colorful custom luggage tag art. The vintage-inspired piece adds a sense of wanderlust to your baby’s nursery, and with multiple colors available for the tag, simply add vital details for your wee traveler, and display them in a fabulous 25-inch by 19-inch black frame. Take the phrase “love you to the moon” and make it real. This lunar lullaby is displayed within a delightful papercut and personalized with your wee tot’s name and birthdate. With four different color combinations and beautifully framed, it is a memento that you and your sweet baby will treasure forever. Intended for the racecar driver in every little tyke, this tailor-made book will delight your speedster-to-be, who races past his two best mates to first place fame. Your wee man will love being the star and the recipient of an award certificate, complete with a personal message from Mom, Dad, or his sweet grandparents. Aimed at brainiacs, this custom hardcover book is filled with 50 pages of puzzles, word searches, crosswords, Sudoku, and more. Add the name of your high-IQ offspring to the cover, a personal message from you, and a quiz based on the year you request – their birthday or first spelling bee win – and it’s a keeper. Whether from Maine or Washington, your birth state is special and memorable. And, when your son is born, you have an extraordinary reason to memorialize this occasion with a made-to-order birth announcement that displays your home’s unique features, from mountains to lakes to monuments. A keepsake for happy parents with bountiful hometown pride. This bright, educational book is custom-made to teach your wee one to recognize letters, spell their name, and features your child’s first and last name as well as birthdate. One by one, brilliantly illustrated animals carry the letters of your little one’s moniker until it’s spelled out in perfect rhyme and festivities begin to happen! The quest for courage is exemplified in this storybook-inspired illustration which casts your child as a brave literary figure and includes a parent’s rave “review.” Ideal for newborns or young children, it commemorates early magical memories and transitions from nursery to bedroom to adult keepsake and it’s made-to-order for a deeply personal experience. For sweet, personal, and charming baby boy gifts, choose a precious hand-milled baby block. Crafted from American hard maple and custom engraved on six sides with details of the moppet’s birth, this work of art shows in the details and the recipient will forever cherish this unique keepsake. Cast your little person as a legendary literary figure – whether a newborn making a debut or a young child in the first few pages of his or her legend – with this delightfully, custom-made print which features a storybook-inspired illustration, and parents’ “review.” It’s ready to hang in a sleek black frame and is forever memorable. If you’re looking for simply adorable, tailor-made baby bibs that are 100% cotton, machine-washable, and affordable, look no further. This set of three bibs can be custom embroidered with any name or monogram, a choice of nine font options, and they have fun prints on one side, super soft terry cloth on the other. Perfect! Showcase your darling baby boy’s first photo in the aptly named Darling Baby Boy Personalized Picture Frame. The frame is highly crafted wood with a high gloss laminate front, with baby’s birth information and name along the left side, and five color options. While selecting one photo among many may be challenging, memories are sweet. There is something so precious to a handmade wooden memory box, and adding your cherished baby’s name and date of birth will make it even more special and beloved. This particular box features a teddy bear, stars, and white top, ideal for wee boys and their treasured mementos. Gift your wee lad with a tailor-made piggy bank that bears his name, makes him smile, and encourages him to save his pennies. This adorable ceramic piggy features a choice of font styles, hand-painted blue polka dots, and your tot’s name in a blue vinyl applique, creating a treasure on many levels. This mom’s blog begs for a read as her narrative is easy to follow, she’s delightfully self-deprecating – in a positive, engaging, “wow, I relate to her” kind of way – and her projects are really awesome. This one is her making round fabric wheels for her little dude and it’s definitely worth a click. Easy to follow directions and super-affordable, this blog features a mom making a super adorable teddy bear with ears beanie for her adorable little tot. It’s super easy even if you don’t sew – she states this categorically – and the pics of her baby sleeping seals the deal. Avoid department store prices and make a few. So, this mom is both a sewing and a blog goddess. She provides photos with numbers – 1 through 6 – that guide you through each step of the process on making a plush baby dinosaur (cut, sew, stuff, etc.) Directions/instructions are solid, product is amazing, baby is super happy. Definitely, please, yes: she deserves applause.